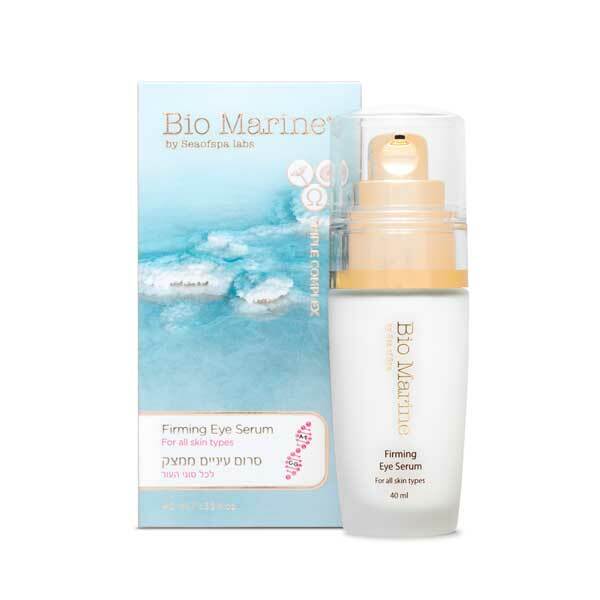 Bio Marine Firming Eye Serum is ideal for thin and delicate skin around the eye. Enriched with Dead Sea minerals and other essential ingredients this serum will smooth the creases around the eye area. Bio Marine firming eye serum is suitable for thin, sensitive and delicate skin around the area of the eyes. It is also suited for the lip area and the neck area. The serum is a concentrated serum that consists of a delicate texture. This Dead Sea product will nourish and smooth the creases around the eyes, leaving the skin looking fresh and supple. This wonderful Dead Sea cosmetic is made with Dead Sea minerals which are known worldwide for their therapeutic effects and health benefits, omega 3, 6 and 9 which are known for balancing the skins moisture levels and is beneficial to skin, carrot oil which aids the anti-aging process and is also soothing, Obliphicha oil (sea buckthorn) prevents wrinkles and is rich in antioxidants and Dunaliella alga extract which is full of antioxidants and vitamins.